You will love this pancake version of the traditional Platanos Maduros (Dominican sweet fried plantains). Brown sugar-caramelized plantains are mixed in a light a fluffy pancake batter for a vegan dish that's guaranteed to bring your weekend brunch game up a few notches! Plantains are banana's starchier cousins, filled with vitamins and nutrients. They take on a sweeter flavor and softer texture when cooking, and are one of the most important ingredients in Dominican cuisine. Pan-frying the batter in coconut oil instead of butter gives them a faintly tropical feel. Drizzle the pancakes with maple syrup for extra sweetness! You can also serve these delicious pancakes as a side dish to a Latin-inspired meal with chicken, beef, rice, and beans! Plantains are now widely available in most grocery stores, but you can also find them in Latino markets or shops with a good produce section like Whole Foods. Per Serving: 611 calories; 21g fat; 103.1g carbohydrates; 6g protein; 15mg cholesterol; 690mg sodium. These pancakes are really sweet! Next time I may not caramelize the plantains beforehand, I may just smash them and use them like the banana pancakes recipe on this website. Still, they were really good and I like the use of the plantains. I love plantains, but never thought to use them in pancakes. This recipe was really easy. I didn't add the brown sugar because I don't like them that sweet, but I know a lot of people do. Good recipe. 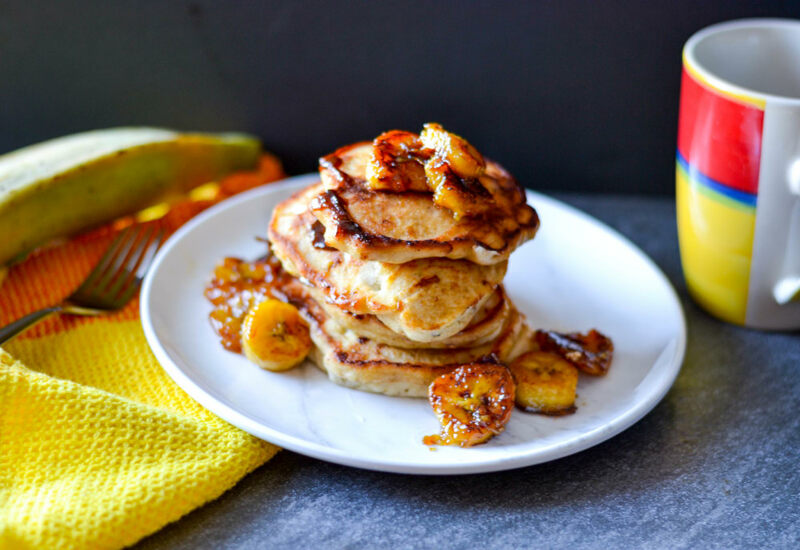 Delicious plantain pancakes. It basically replaces bananas. I bet you can also mash them and fold into the batter, but I caramelized mine in the skillet first as the recipe says. Very good recipe. Pancakes are a huge favorite in my house and these were instant classics. The plantains add a sweetness to them that you don't get with bananas. To make them a little healthier I added some rolled oats to the batter.